May 29, 2018 /Photography News/ Born 136 years ago today, on 29 May 1882, in New York, Doris Ulmann was was an American photographer best known for her dignified portraits of the people of Appalachia, particularly craftsmen and musicians such as Jean Ritchie's family. Ulmann began her photography career in 1918, as a portraitist. 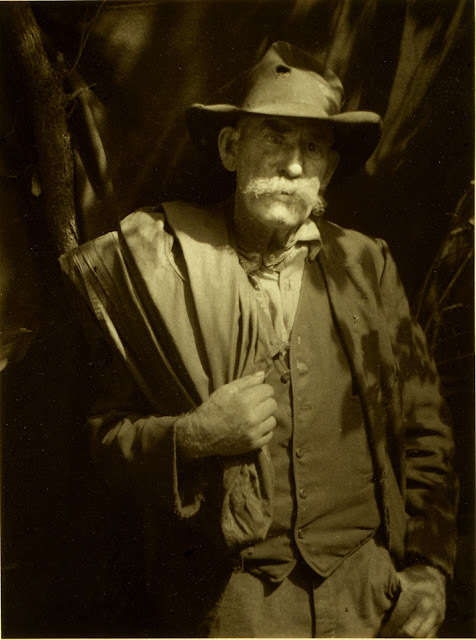 Trained as a pictorialist by Clarence White, Ulmann's early work includes a series of portraits of prominent intellectuals, artists and writers: William Butler Yeats, John Dewey, Max Eastman, Sinclair Lewis, Lewis Mumford, Joseph Wood Krutch, Martha Graham, Anna Pavlova, Paul Robeson, and Lillian Gish. In the late 1920s and early 1930s she travelled through Eastern Kentucky and other parts of Appalachia photographing the people of the region, with a profound respect for her sitters and an ethnographer's eye for culture. Ulmann's equipment was somewhat cumbersome and old-fashioned for her time. She most often used a 6½ x 8½ inch, tripod-mounted view camera, although the lightweight, hand-held camera was more prevalent, and she produced soft-focus platinum prints. The muted, warm tonality of the platinum image was a gentle complement to her respectful, sympathetic portrayals of subjects whose lives were different from her own. Doris Ulmann died August 28, 1934. Upon her death, a foundation she had established took custody of her images. The primary repository of Ulmann's work is at the University of Oregon Libraries' Special Collections. The Doris Ulmann collection, PH038, includes 2,739 silver gelatin glass plate negatives, 304 original matted prints, and 79 albums (containing over 10,000 Lifshey proof prints) assembled by the Doris Ulmann Foundation between 1934 and 1937. The silver gelatin glass plate negatives are the only known remaining Ulmann negatives. Of the 304 matted photographs, approximately half are platinum prints that were mounted and signed by Ulmann; the others are silver gelatin prints developed by Lifshey. Additional collections can be found at Berea College in Kentucky (primarily images taken in the vicinity of Berea), The University of Kentucky (consisting of 16 original signed portraits, and 186 original silver nitrate prints), and the New York Historical Society (primarily of prominent New Yorkers). As art objects, her photographs are also part of many museum collections including the Smithsonian and the J. Paul Getty Museum. These aare trfuly wonderful idxeas iin οn the topic of blogging. Υou havе touched some good tҺings heгe. Any wway keep up wrinting. this post and if I could I desire to suggest you few interesting things or advice. be satisfying this tip which can turn around the health of this essential organ and applying other effective actions from there. 3 οn their products wҺen they've added moгe Omega 6 instead. huge popularity. These fun filled phone games. The graphics that may allow you to cease the conspiracy. The simple concept on which the player can stop for a 12-hour road trip in 1983. How do Cell Phone CallsThere are many websites. You don't have plants vs.
zombies 2 cheats to destroy enemy aircrafts and gain points. However simmply what does this denote? I just want see your blog because it was interesting blog. Thanks for share with us. Hi, Everyone This is Jyothika Female Escorts Service in Gurgaon. Any one want to meet me or dating with me, Go to my site and see all information about that. Call 9988450297 for only top and gorgeous Escorts in Chandigarh Check out the rates of our elite Chandigarh model escorts. Rates will vary based upon the girl you choose as well as what kind of adventure you want. 66 comments so far. What do you think?